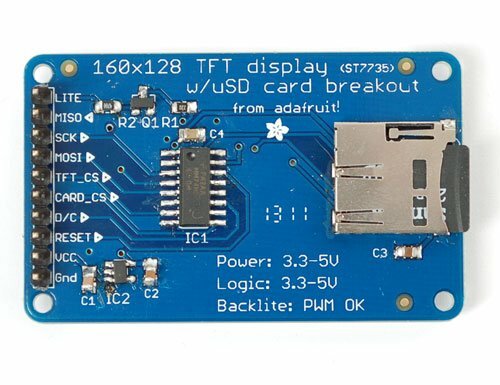 This tutorial from Adafruit is for a 1.8″ diagonal TFT display & microSD breakout board. This breakout is the best way to add a small, colorful and bright display to any project. Since the display uses 4-wire SPI to communicate and has its own pixel-addressable frame buffer, it can be used with every kind of microcontroller. Even a very small one with low memory and few pins available! The breakout has the TFT soldered on (it uses a delicate flex-circuit connector) as well as a ultra-low-dropout 3.3V regulator and a 3/5V level shifter so you can use it with 3.3V or 5V power and logic. Adafruit board also had a little space to placed a microSD card holder so you can easily load full color bitmaps from a FAT16/FAT32 formatted microSD card. There are two ways to wire up these displays – one is a more flexible method (you can use any pins on the Arduino) and the other is much faster (4-8x faster, but you are required to use the hardware SPI pins) We will begin by showing how to use the more flexible method. You can use any 4 or 5 pins for this method. We’ll show using pins 4, 5, 6, 7, and 8 and once you have it working, you can change those pins around in the wiring and in the sketch. Start by wiring the power pins. Connect the leftmost pin to Ground and the next pin to +5V. Connect the rightmost pin (backlight) to 5V as well. If you plug in the Arduino you should see the backlight turn on. Next connect the RESET (TFT reset pin) and D/C (TFT data/command selection pin). Finally connect the remaining digital pins, TFT_CS (TFT chip select), MOSI (data sent to TFT) and SCK (clock sent to TFT). That’s it! If you want to change the wiring, you can use any pins but don’t forget to change the top of the sketch to match! Once you have the display wired up, its time to test your wiring by uploading the example code we have written. 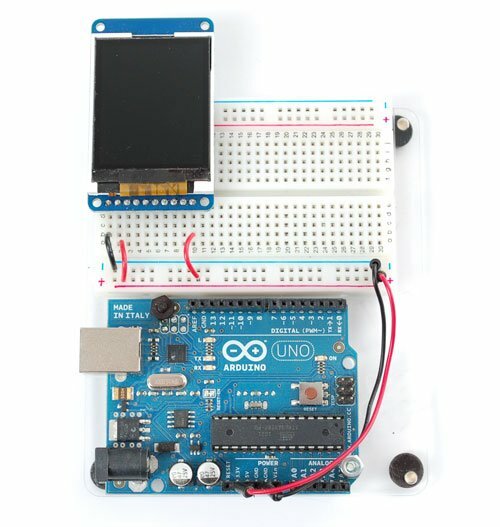 Adafruit suggest using an Arduino to test. Restart the Arduino IDE. You should now be able to select File > Examples > ST7735 > graphicstest sketch. Upload the sketch to your Arduino wired as above. If you want to connect to the display and have high-speed data transfer (4-8x faster) you’ll have to use the hardware SPI system. This is optimized to be faster than the flexible wiring method (because its built into the hardware of the chip) but you are required to use the hardware SPI pins! On Atmega 328/168/8 type Arduinos (‘classic’ type) the hardware SPI pins are 11 (MOSI), 13 (SCK) and 10 (CS). For Megas it is 51(MOSI), 52 (SCK), and 53 (CS). The CS pin can be a different pin but if you use any other pin you must still have the hardware SPI CS pin (10 or 53) as an output!